My blog piece on the Fellowship of Reconciliation Blog about “Stories of the Revolution” exhibition. 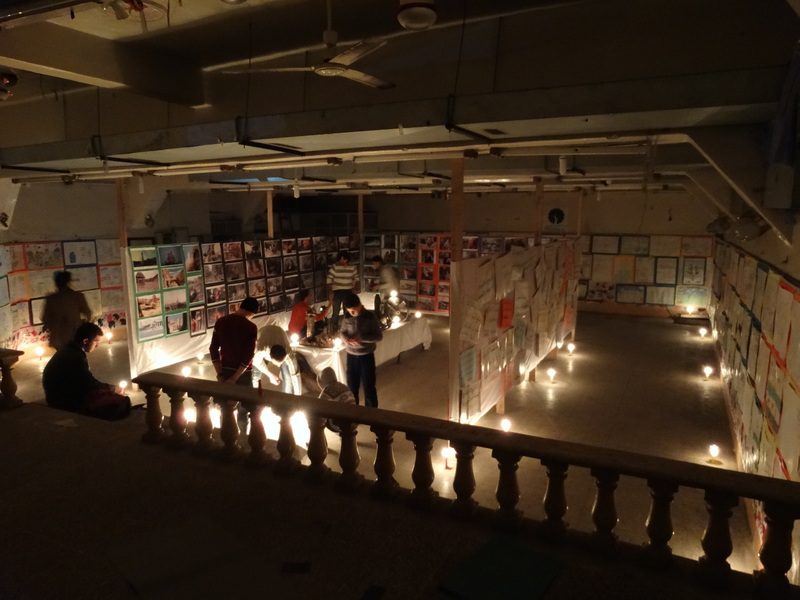 The exhibition was co-organised by the Syrian Nonviolence Movement in Aleppo. “Terrorism does not fight terrorism” declares a Syrian protest sign, emphasizing that the brutal Assad regime and the repressive Islamist extremists are two sides of the same coin. The sign tells a story. Two civil resistance groups, I Am Syrian and the Syrian Nonviolence Movement, sponsored an exhibit called “Stories of the Revolution.” The display took place in two rounds during March and April, in part of Aleppo outside regime control, despite Aleppo’s ongoing devastation by the regime’s barrel bombing of civilian and armed alike in the area. Syrian activists know that telling the stories of our struggle is not only crucial to the contest for power, but is empowering for the traumatized population of Syria. A big screen in the street shows clips of Syrian revolution songs, attracting a stream of visitors into the exhibition, including women, children, and even rebel fighters. Nonviolent resistance activities are capable of reaching diverse segments in Syrian society. The exhibition displayed banners held in the street in the last three years of Syrian protest, signs that show the dreams and principles of activists in the Syrian revolution. Signs declare, “Values from heaven, but a homeland for everyone” and “We don’t care what you believe in, we care about what you will do with those beliefs, build or destroy,” affirming the democratic pluralism of the civil, not theocratic, state we envision for post-Assad Syria. Another protest poster on display reads, “We Want a Strong Judicial System,” supporting the rule of law rather than the corruption Syrians have experienced for decades under the Assad regime. One wall of the exhibit hall bore images showing the brutality and destruction of Assad’s regime, homeless Syrians in the streets, misery in the refugee camps, and the refugees’ intense wish to go back home. The “Wall of Hope” features images of nonviolent protests and creative resistance activities. While world media continues to focus almost exclusively on armed actors in the Syrian Revolution, these pictures show the persistence of our widespread civilian struggle for freedom, justice, and pluralism in Syria. Sculptures made from remains of mortar shells stood in the middle of the hall, highlighting Syrian capability of transforming the tools of destruction into something constructive. Paintings made by children dominated several walls, reflecting sadness, fear, and hope for a better future. One small dream many children expressed was to be able to play with their friends safely in the streets. 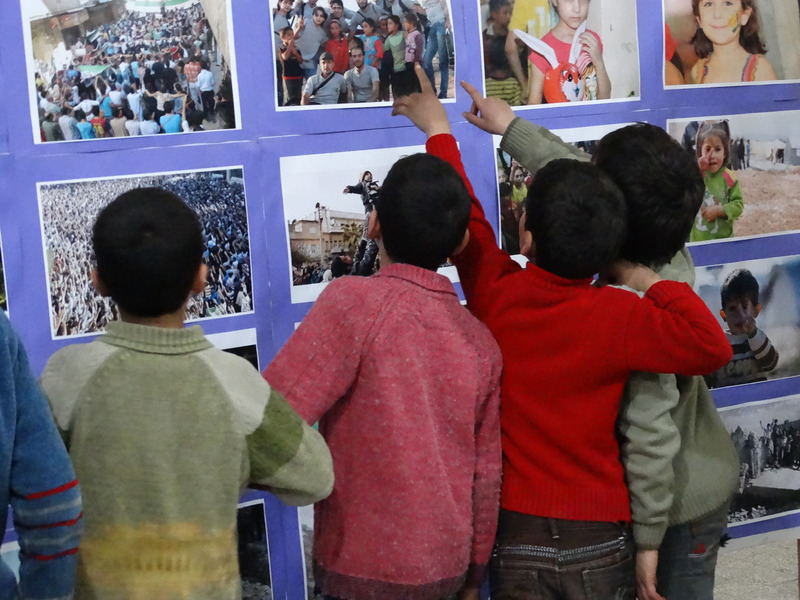 The exhibit underlines how important it is for traumatized Syrian children to feel heard. Even in eastern Aleppo, under intense shelling by Assad’s regime for months, activists of I Am Syrian and the Syrian Nonviolence Movement, along with many other civil resistance groups, doggedly continue their peaceful struggle. Syrians are not to be typed as either victims or armed rebels in this revolution. The endurance of nonviolent struggle offers Syrians, as well as anybody else in this world, hope. Ibrahim Al-Assil is director of the Syrian Nonviolence Movement. This entry was posted on Tuesday, April 22nd, 2014 at 8:29 pm	and tagged with Aleppo, creative resistance, FoR, syria, Syrian Nonviolence Movement and posted in English, عام. You can follow any responses to this entry through the RSS 2.0 feed. of your site is great, let alone the content! I wonder how so much effort you place to create such a great informative site. happy. I have learn this post and if I may I want to suggest you some attention-grabbing things or tips. his web site, as here every data is quality based stuff.